Tomorrow at MKCC we launch a brand new series based on one of the most well know passages in the New Testament. In his letter to the church at Corinth church leader Paul laid out an incredible description of love. 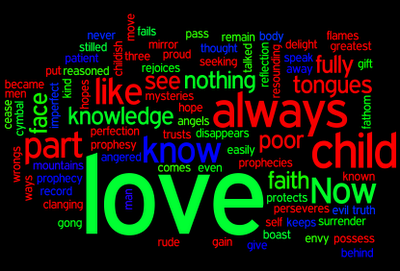 Here is a wordcloud from wordie of that incredible chapter. Don't forget a single blessing! Ever wonder why you are in God's Kingdom? Who is on your heart? UK Church on the up?